There are numerous distractions when on the road especially when driving in the city. Between other drivers, traffic lights, pedestrians and street signs, it isn’t always easy to have 100% focus all the time. It gets worse when there are other distractions in the vehicle as well. The last thing we want is to end up in an accident. Accidents can be very expensive and for us to be the individual who is at fault it can be more so. Manufacturers have noticed this though and have found opportunities everywhere to aid in making our drives more comfortable, convenient and safe. Inside the car, we have phone stands, car air purifiers and more. For the outside of the vehicle, there are additional mirrors and racks too. This article goes into blind spot mirrors. When changing lanes, especially in bumper to bumper traffic, it can be hard to simultaneously watch the traffic ahead of you and the traffic behind you. This alone could cause an accident which was the whole point of looking over your shoulder in the first place. These products are meant specifically for that purpose, they check those hard to see areas for you. They also come in handy for when someone who is new to driving or just not realizing they are doing it, is driving in your blind spot. And finally, they are handy for larger vehicles that have even larger hidden areas or when they have something large blocking their view. Even though they seem like something so small and irrelevant, they can be the difference between safely changing lanes and a car accident. There are a couple different variations on the market currently. There are products of this type that stick directly on you side-views and there are some that completely replace your rearview and extend your overall view. The biggest advantage of this type of product is that they are inexpensive. With the cost of this type of product and with the cost of a car accident, this purchase is a no-brainer. We did some research on the top products on the market today. These were tried by real people then rated and reviewed. We chose this route because there are so many consumer goods on the market today and so much false advertising that it is really hard to figure out what is good and what isn’t. The first thing we do when looking for good products is ask a friend who has tried it. This way we get a good idea of whether the product works for them and what doesn’t work. If trying out a new face cream and your friend has oily skin but you have dry skin, the results will be very different. By your friend saying “It makes my skin feel too oily”, this won’t necessarily discourage you. We find products that are good and we find reviewers issues with them. Your issue and their issue may be very different and therefore that is why it is good to see the good and bad of all products. We also encourage you to read the criteria for evaluation and the commonly asked questions at the bottom of this article too so that you can see how we decided on our criteria in this article. So without further delay, here is the top on the market for 2018. This product is our Editors Choice. It was highly rated by consumers and is known to be really reliable. 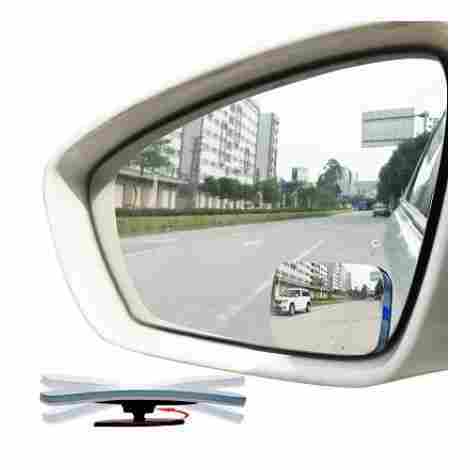 It comes in a 2 pack so that both side views each have one, giving the driver a fuller view of the road. This product is ideal for larger trucks. Specifically, ram trucks, these are designed (but not limited to) enhanced road view for bigger trucks. 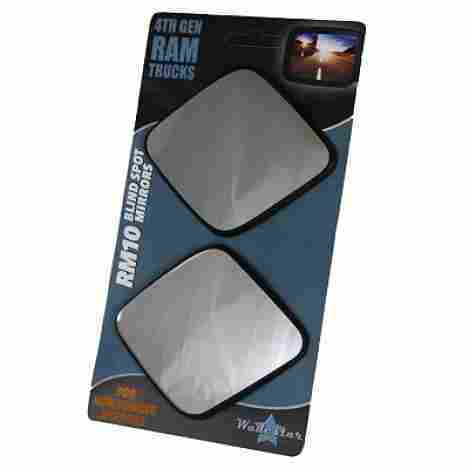 These are ideal for those who do not have towing mirrors currently installed as a replacement. These are great because they can fit either to the lower or upper outer edge of the mirror. This helps for those who have indicators on the mirror to avoid them having to be covered up. This product is mid-range in price but still quite inexpensive due to its benefits. 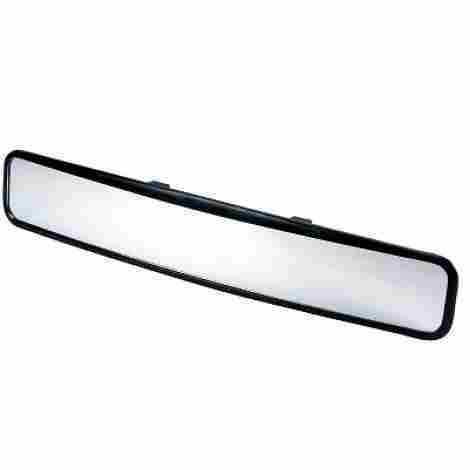 This will not only aid in avoiding accidents but it also is good quality and can fit on different areas of the mirror. It is a good deal considering its benefits. This product is our Top 3 product. It also comes with 2 in the package. These are quite small on the mirror but have a 360-degree view. They give the driver 3X larger and clear view than comparable products and are adjustable. The product is an 'all weather' product. It has a super strong bonding glue that is sure to last through all kinds of weather. 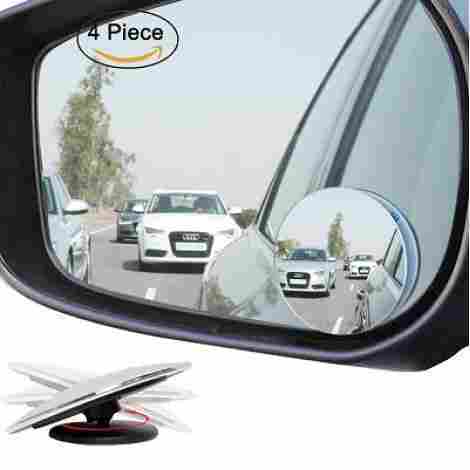 This product has a 360-degree rotation as well as 30-degree adjustable view to maximize the view of the road behind you by making it 3X bigger than comparable products. This is a very inexpensive. They have a very high consumer rating, they are attractive in appearance and they help magnify the road. We are confident you will not regret this purchase. This product is our Best Value product. It is inexpensive in price. It also comes in 2 pieces, the product is 2 inches in diameter and also has a rotatable mounting bracket. It comes in both round and egg shape. This product has a mounting bracket that allows the mirror to swivel without moving the base. This is ideal for taller or shorter individuals in order to get the most of the product. This mirror is 2-inches in height and has a frameless design to optimize the view of the road. The glass will not haze and is suitable for all weather types. As previously mentioned, this option won the Best Value award. It's the lowest priced product on our top ten list and still offers very good value despite its price tag. If you're searching for a blind spot mirror that won't break the bank, this one is right up your alley. 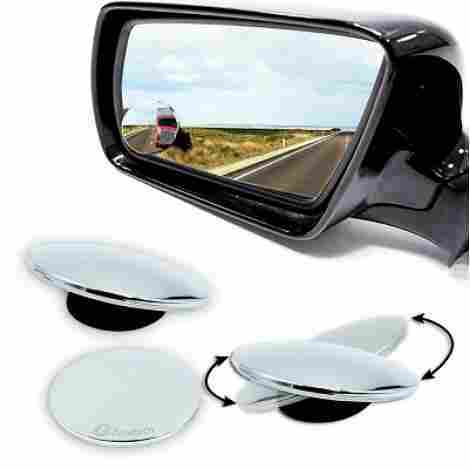 This product is another 360-degree one that can either attach to your side view or rear view. This product is a little wider than some of the other stick-on products in this article and can be installed length-wise or width-wise. It is ideal for all types of vehicles including SUVs and RVs. Rather than small and round this product is a little longer in shape. This offers more of a wider-angle for those who prefer a larger option. This product is water-proof, rust and haze resistant. There will be no issues with longevity or fogging when driving with these features. This product is lower in price. There are two in a package and can be used either inside or outside the vehicle. Additionally, they will be able to stand the elements. For these reasons this product is worth the cost. This product is another side view option and includes two in each package. It also has a 360-degree swivel head and is square in design. It also is a little larger in size and is rectangular rather than circular like the majority on the market today. These have an anti-glare coating ideal for more humid and cold areas. There will be no issues with any fogging up when driving in less than ideal environments. This mirror is very strong. Even if installed incorrectly and mirror falls off during the drive, this product (assuming you are able to get it back) will still be intact. These are a little bit more on the expensive side. A common complaint with reviewers with this type of product is that if the product falls off the mirror during the drive then the product breaks and is useless. Because this one is shatter-proof it will last you much longer than comparable products. That is why this product is worth the cost. This product is a little different from the others in this article. 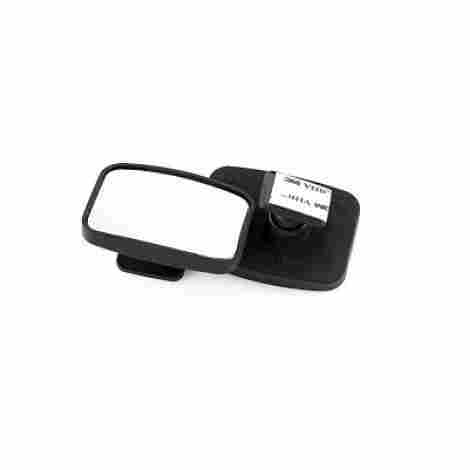 It is a clip-on wide angle product that attaches to your rearview. This product is good for those apprehensive about adhesives and would prefer something that is temporary and easily transferable. This product is much wider than your actual rear view and quite obviously larger than the stick on varieties. 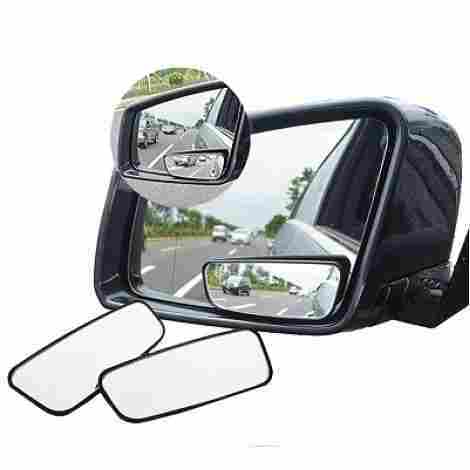 This will extend the rear view view and give better blind spot sight when driving. Because this product clips on it is easily transferable between vehicles. It also can come off and on easily if required. It has no harsh adhesives that need to be removed and it is a super easy install. This product is mid-range in price. The fact that it not only installs easily but also can be taken off just as easily plus the huge view and being able to avoid completely removing your current rearview jusfities the price. This is definitely a good value for what you are getting. This product is stainless steel. This product mounts above the door or window. It is very durable and ideal for big trucks. This product comes with a mounting bracket and actually mounts to the door or window of the vehicle for a better view of the road behind you. This product is versatile. It can be used on vehicles but can also be used around the house or in a business. This product is on the higher end in price. It's a little more expensive however this product can be installed and uninstalled very easily. Plus it is versatile so if needed, this can be moved to other areas. Because of these perks this product is worth the price. This product is an ultra-thin, rectangular option that mounts with 3M tape. It comes in either a 2 pack or 4 pack if required. It also has a 360-degree rotate and a 20-degree adjustable swivel. 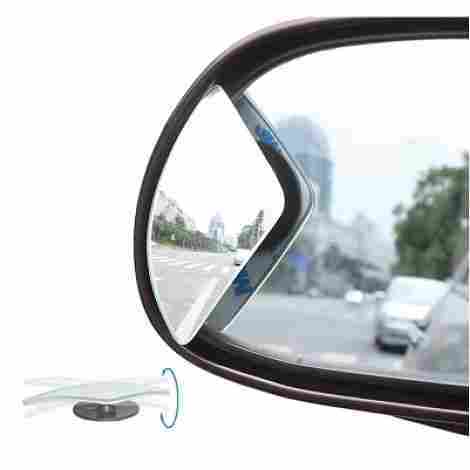 The product itself has a flexible convex mirror for helping view the road behind so customizable to the driver. This product is ultra-slim in design, making it less noticable and more esthetically pleasing. This product is completely waterproof, so it will not rust or haze with humidity. This product is inexpensive in price. It is highly rated, easy to install and completely waterproof so it is ideal for those in more humid climates. This product is more than worth the cost. This product is a two pack, two inch option. It is adjustable and will increase the view during your drive. This product will magnify the object it is reflecting to give you a better and easier view. This product will hold even if the side view mirrors are heated. This product is inexpensive in price. With the benefit of being able to use it on a heated mirror and the size, visability and magnified view this product is worth the cost. This product is a little different in design. It is triangular in shape with rounded edges. It is more aesthetically pleasing in appearance but still has the 300-degree view and 30-degree rotation. This product is more attractive in design. Due to the triangular shape, it looks more in line with an additional feature of the vehicle rather than an aftermarket add-on. This product can be used on a wide range of vehicles despite its design. It can be used on all trucks, cars, SUVs, RVs, and vans. This product has a new and modern design even though it is really quite inexpensive. This product is worth the cost due to the esthetic benefit of it. In conclusion, there are numerous options available depending on your preference. Most of this type of product has a 360-degree view to enhance the reflection of the motorists behind you. The adhesives should be sticky enough that they can live through all the elements but not so sticky that they are impossible to remove. The stick-on varieties are usually interchangeable between both the interior and exterior of the vehicle. If the adhesvie type is unfavorable the clip on variety may serve you better as there is very little installation required. The shape of the product is up to preference as there are circular, egg shaped, rectangular and triangular available. We hope that this article was helpful to you in your buying process. Below we explain what criteria we used to help decide on each product. Happy Travels! You want to make sure that the product that is being manufactured is made out of quality materials. Those materials should be able to withstand different types of weather as well because the majority of these items are being used on the outside of the vehicle. The material of the item being made should be able to withstand the elements including sand, snow, and rain. They should also be able to handle these elements for an extended period of time. The materials used to make these should also be able to withstand cold and humid weather without fear that it will fog up. This product is useless unless you can see the object it is pointed at. The glue or adhesive material used to hold the product up should also be able to withstand the elements especially heat. Heat can often soften glues and stickers to the point that they fall off. If you reside in a humid or hot climate the glue should be able to withstand pretty intense heat because the vehicle itself attracts a fair amount of heat in general and that glue, if poorly made, will fall right off. For the products that screw onto the vehicle, you want to make sure that it’s components will not rust or break down with time. The outdoor products also need to be rust proof in order to maintain the integrity of it. The reputation of a manufacturer is always important because that will indicate whether or not the manufacturer is producing quality products. It is also indicative of how hard/easy it will be to return the product if not satisfied. The manufacturer should also have experience in the industry of making the type of product you are purchasing. There is a lot of crossover with companies typically and you will see some manufacturers making new products that are much different than that that they’ve made before. If a juice company started making automobiles, we doubt that trusting that company would be easy. You want to know that they have been in service making that product for long enough that they’ve worked through the kinks and came out with a superior product. You also want to make sure that the products that are being made are being made with the proper materials and that those materials are accessible to the company. Purchasing from a local manufacturer is good because you know that they understand the climate and what is entailed for the product to last in that weather. This isn’t as sound because companies in hotter climates can understand what is needed in colder ones but to have someone local making your product adds reassurance that they understand your needs and ultimately what will work outside. The products in this article are range a little in how they work for the driver. Some of the products go on the outside of the vehicle and stick to the side mirror for ease of use when driving. Some of these are 360-degree domes for a fuller view of the road and surrounding area. 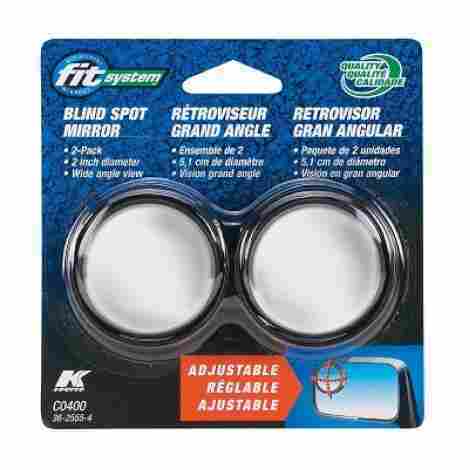 Some of the other products are either longer or wider for better ability to see behind you from your rearview mirror. These tend to be flat and not rounded because it extends the view in a larger way and doesn’t require that function. The rear view options are harder to install because they require tools and removal of your existing rearview mirror unless they clip. While the other options that stick on the side view are only held on with 3M-type tape. The rear view mirrors are much larger and require less strain on the eye while the smaller side view options are much smaller and may require good eyesight in order to use. The smaller stick-on variety does come in different sizes and if they are preferable then a larger one may be the best option. You also want to ensure that the product is ideal for the environments that you are driving in. If you are in really cold environments you want to make sure that the product you are getting doesn’t fog up when cold. All mirrors will accumulate frost but it should be able to be brushed away fairly easily as well. You also need to make sure that the glue doesn’t fall apart when it gets too cold and that the glue doesn’t break down very easily. If you live in hotter climates or if the vehicle you are installing this on has heated side mirrors make sure that the glue that is included won’t break down due to the heat as well. If the climate you are in is humid then the mirrors should be relatively “fog-resistant” to ensure that you can see the reflection at all times. All the metal should also be rust resistant in order to prolong the longevity of the product. Similar conditions should be met in regards to the rearview mirror as well. We mentioned this above but for those who have eye issues then the larger mirrors should be used. And it really depends on the preference for the vehicle being driven. Some vehicles rely electronically on their rear view and it may not be best to replace it. In that case, the side view stick-on variety will probably be ideal. Q: How do you install a new rear view mirror/stick on ones? A: It depends on the product. The smaller ones that are meant to install on the side views are usually a 3M adhesive. They can be applied by firstly cleaning the space with soap and water, allowing it to completely dry then taking an alcohol swab and cleaning over the are again. Let that completely dry and then taking the protective backing off the back of the sticker apply the sticker to the area recommended on the packaging. This will most likely change depending on the product and the mirrors (some have indicators that can’t be covered up so some creative placement may be required). The manufacturer’s website will be able to help too if more instruction is needed. The installation rear views are a little trickier. First of all, you need to make sure that you can remove the rear view. Some have electrical components that can’t be disconnected or can be but shouldn’t. Ensure that yours does not have this issue. If you are good to go, then you may still need to disconnect your battery just in case there is a cord in there that is live. 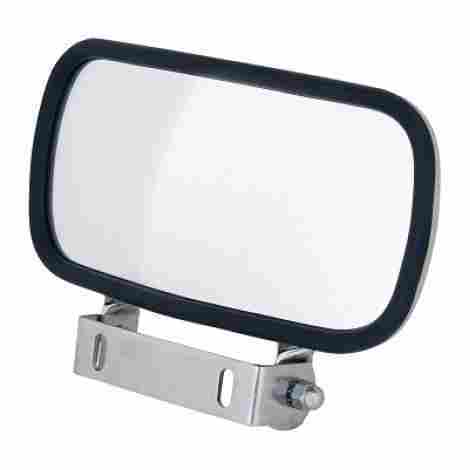 Most vehicles have a small area just below the mirror that has a removable piece that is hiding a screw. Find that area, remove the cover and find the screw. From there, remove the screw. This should be enough to be able to remove the mirror. Remove it and from there you will want to clean the harness still attached to the windshield. This may have some thicker debris behind and an electrical cleaner may be required (this can be found at your local hardware store or on Amazon). If the new mirror fits on the harness, great. Replace the old with the new and screw it back into place. However, if it does not fit on the existing harness, the harness will need to be removed. Remove it by heating up the base where the adhesive is enough so that it is warm to touch. Move the harness back and forth until it is removed. Note where the original rear view was before because you are going to clean that area of debris and when replacing it with the new product you are going to want to know exactly where the new one should go. Use a razor blade to clean off any leftover adhesive. If the area needs more cleaning, take soap and water to it until the rest of the adhesive is gone. When it is dry, again, use an alcohol swab to clean the area and allow it to dry completely. The new harness will have a protective sheet over the adhesive sticker. Take the sheet off and apply the new harness directly to the area where the old one was. Hold there for about 30 seconds firmly. From there you should be able to attach the mirror, screw it back on and hide the screw. These instructions are general instructions. The package will have more detailed ones for your particular product. Ensure you are reading those as well before attempting to replace the product. Q: Will installation wreck my car? A: No, there are adhesive removers that will help get the excess adhesive off the vehicle if you decide that the product needs to be removed. As long as you are following the directions, these products will not wreck the vehicle or decrease its resale value. Q: Does a professional need to install this type of product? A: Not the side view options but with the rear view there may be a need for one. This is especially true if there is some electrical work that needs to be done. Most rear views today have electrical components to them and therefore on most newer vehicles, it might be wise to have a professional install it. Even with the non-electrical products, if you are not mechanically inclined then it might be smart to seek advice or help from someone who is just to be safe. Q: Can it be transferred to a new car if I sell this one? A: The side views may be hard to transfer but it is definitely possible. You may need to purchase a new adhesive strip for the transfer process. If the product is still fairly new and you are resourceful, a hair dryer on high heat may be able to get the product off without leaving too much of the adhesive behind. If this works then try to keep the intact adhesive warm while transferring it to the new vehicle. This will help bind the adhesive to the new vehicle. Ensure that you are also doing the full cleaning process to the new vehicle mentioned above (soap and water, alcohol swab, fully dry). This may work if you are careful enough but it does depend on the product. Q: What is the advantage of 360-degree view? A: The mirror is a little more convex and therefore will show you a more ‘fish-eye’ view of the road. This helps to get a better view of everything around you because it magnifies the images. Some of the products in this article also have the ability to swivel in a circle manually so that if you are really tall or really short they can adjust to your comfort level. The only issue with it is that it can be harder on the eyes due to the manipulated shape and it may not be great for those with eye issues.